More generally Professor Gaffney argues that big sporting events like the World Cup and the Olympics don't result in the kind of economic benefits to the host countries that are touted. This is a real issue for those countries with great needs--poverty, housing, environmental degradation, etc.--and the money spent for sponsoring such events--Brazil is spending $11 to $14 billion on the World Cup--comes at the expense of other priorities. Also see "World Cup, Olympics test Brazil's development dreams" from the Miami Herald. I am the last person to defend sports as economic development. The research is pretty definitive that at the metropolitan scale, spending on sports merely substitutes for spending on other forms of entertainment. And I do think that most big sporting events tend to not have the effect that is expected, at least in the short term, partly because expectations are too big and unrealistic, and because of how hype can backfire and discourage people from attending because of a fear of congestion (e.g., with regard to the London Olympics, "Olympic bargains galore as London's theatres and hotels slash rates" from the Guardian). Can communities better leverage economic and other returns from sports arenas and stadiums? And even though I argue that most sporting halls (stadiums and arenas) don't do all that much for local communities, I have come to realize that the issue isn't that stadiums and arenas categorically are incapable of contributing to community and economic development, it's that plans for achieving such benefits aren't very clear or purposeful and benefits are expected to occur by happenstance--"trickle down." I wrote a piece a few months ago, "An arena subsidy project I'd probably favor: Sacramento," (which followed related pieces, "Stadiums and arenas as the enabling infrastructure for "money-making" platforms" and "Sports stadiums (and arenas) and local economic development and a DC soccer stadium") that began developing a framework for stadium planning in ways to ensure better economic results for local communities, based on various factors such as transit connectivity, location, etc. how people travel to events: automobiles vs. transit--if automobiles are the primary way people get to events, then large amounts of parking usually in surface lots needs to be provided, making it difficult to foster ancillary development because of lack of land and poor quality of the visual environment, whereas if transit is the primary mode, then more land around a facility can be developed in ways that leverage the proximity of the arena. Plus, the McKinsey consulting firm argues in "Is sports sponsorship worth it?" that even big sponsors don't necessarily benefit, unless they refocus how they leverage their involvement with teams and events in more direct ways. If even big corporations are wasting a lot of money on their "investmments" in sports, you have to figure that local communities are definitely missing out. Also see the Associated Press story "OHIO OFFICIAL'S IDEA: BAD TEAMS GET LESS TAX MONEY" about how Cleveland's Cuyahoga County Executive Ed FitzGerald suggests tying performance to tax funding going to professional sports teams. Plus, I came across the example of the new basketball arena in Bilbao, where they built in a community and recreation center as part of the facility, and residents have access even to the big arena court when not in use by the professionals, but also Everton in Liverpool, where the owners have been quietly acquiring adjoining properties for years and letting them rot, in order to be able to expand the stadium. Can communities better leverage the economic benefits from sporting events? With big events, I think that there is the potential to better leverage them for direct economic return, and academic research is starting to address this issue, including festivals, like the European Capital of Culture, which is what I was researching mostly at the time, but I haven't had a chance to look at much of the work. -- Chalip, L. 2004. “Beyond impact: a general model for host community event leverage”. In Sport tourism: Interrelationships, impacts and issues. I do think that without planning purposefully to benefit from the event, localities won't get much long term benefit. We see this definitely with all star basketball and baseball games in the US as well as with the Super Bowl, that locally owned businesses mostly don't benefit. And frankly, I think it's pretty hard with team events as fans are pretty much focused on consuming the sporting event, not visiting and spending money visiting the community. In other words, they aren't "city break" tourists, with the desire of experiencing the broader place "CULTURAL TOURISM AND THE CITY BREAK PHENOMENON") despite the various sites and experiences that may be present there (e.g., the AP story "World Cup's most exotic host city prepares for influx of tourists"). And because citizens are more easily mobilizable because of mobile applications and smartphones, they may be considerably upset with spending on stadiums, sporting events, related corruption, etc. to the point that they demonstrate. 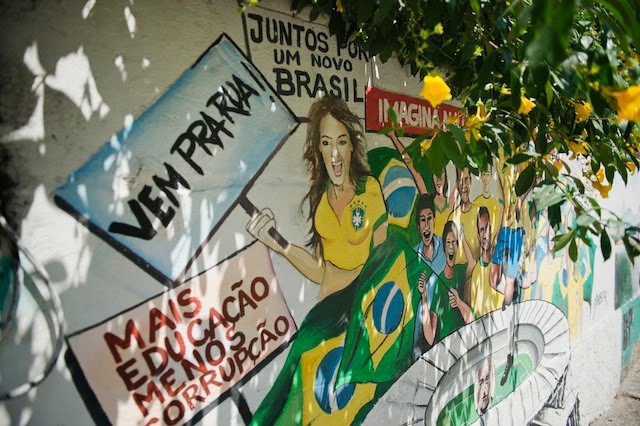 View of a graffiti mural depicting recent protests against the FIFA World Cup Brazil 2014 in Rio de Janeiro on April 08, 2014, Brazil. (Getty Images). For example there have been demonstrations in Brazil against spending on soccer stadium construction, and in Sochi, Russia and Beijing, China the governments seriously cracked down on freedom of expression and opposition as a nationalist response to their hosting the Olympics and the government's fear that the opposition would use the Olympics to bring attention to their issues. Sadly, the International Olympic Committee has mostly turned a blind eye to repression associated with host nation sponsorship, which seems counter to the "ideals" of what the Olympics are supposed to be about. Relevance to DC (and Baltimore). With regard to DC and Baltimore, this is an issue that is relevant, given that the area is vying for a chance to bid on holding the 2024 Olympics ("DC bid to host 2024 Olympics receiving USOC consideration," Washington Post). With the Olympics, many regions look to Barcelona as an example, because they used holding the Olympics as a way to take on and accomplish multiple big infrastructure projects. 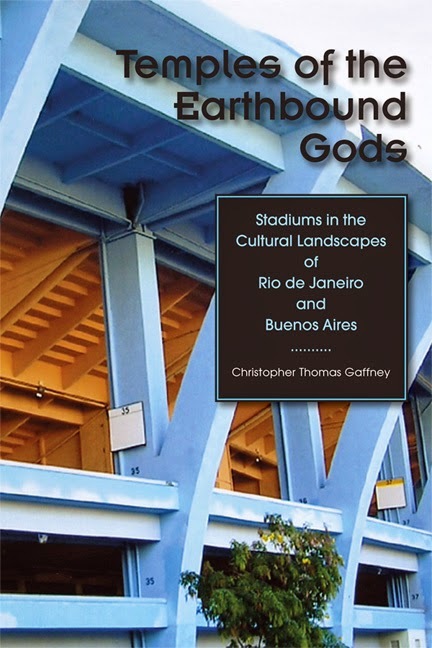 Although Barcelona was successful, while Athens and Greece spent a lot of money on the 2004 Olympics and many of the facilities are not in use now. The same goes for Russia and China with regard to their recent events. DC soccer stadium. Similarly, DC is planning on providing various financial supports for the construction of a new soccer stadium. Business and construction interests are building a coalition to support the project, called UniteDC. If you figure that such interests are too hard to fight, then focusing on how to ensure true economic and community benefits from such a project is imperative. Two sporting venue extremes in the DC area, The contrasts are really apparent: Verizon Center appears to support the businesses in the immediate vicinity while Fed Ex Field in Landover is a wasteland with no connection to anything other than parking lots. The two baseball parks in our region, Nats Park and Camden Yards have some community connections, although it is evolving year after year at Nats Park. I hope that DC officials take a few minutes to read and consider your points. Camden Yards is pretty interesting, because it is somewhat disconnected from where people are, even though it is part of the urban fabric, unlike FedEx Field or the stadium for the Ravens, although as has been discussed here before, football stadiums generally are bad for cities, because they are so rarely used, big, and because attendees are pretty much car-oriented/tailgate, etc. I'd say, based on a previous comment this week, that you are focusing on two other issues. 1. Planning and the ability to leverage. 2. Ethics -- making sure we use the public's resources in a way that is fair. In both cases, the soccer swap may not be doing so well on these measurement. well as in the other post, where EE discusses the difference between economic activity and economic development, that is the issue. What I have come to believe is that planning, especially ec. dev. planning housed in the executive branch of government and usually separate from land use planning, doesn't deal with this very well, if at all. Elected officials don't perceive the difference, so long as they can cut a ribbon, they're happy. But in times of increased constraint of resources and difficult, conflicting objectives, spending money of such things has to be both effective and fair. ... plus, it also comes out of my unwillingness to hold onto absolutes. I've been pretty vociferous that Verizon Center wasn't responsible for the revivification of the east end of the CBD, and that the dev. plan for "Capitol Riverfront" wasn't totally stoked by the addition of the baseball stadium. OTOH, to maintain that position, I've under-acknowledged the contributions those uses have made to the overall program. That's why it's important to (as you say, I don't know why I don't like the term) "unpack" what is going on and what contributes positively to improvement and what doesn't. It's better for me to attack the issue in that way, because then we can build a framework for analysis that helps us reap much better ROI than without the framework. The problem is that dealing with sports teams and leagues is not "an equal playing field" for cities. Elected officials don't want to "lose" the team. And so they are negotiating from a position of weakness which makes it hard to structure agreements and contracts in ways that achieve city objectives more carefully and at a greater rate of return than is preferred by the team. WRT the participation of such countries as Russia and China and Dubai in these international events, they have other goals and objectives that make a realistic ROI not important. Most other countries/cities don't have that luxury. There is an op-ed in today's Post on this topic by Ruth Marcus. And she argues that legitimate public opposition is decreasing the likelihood that democratic cities/countries will participate in bidding going forward, because of the cost, community opposition, etc. Of all places, the GW Hatchet ran an excellent February article on the stadium boondoggle that included comments from four different experts -- Victor Matheson,College of Holy Cross; Neil deMause-author who researches city-funded stadiums; economics professor Andrew Zimbalist-Smith College; and economist Dennis Coates-UMBC -- and long-time researchers in this area. "As one of the supposed 'hired guns' I take great exception to Mr. Evan's comments. I have never been paid a single dollar by an anti-stadium group, who generally aren't the people with deep pockets, anyway. Our numbers always add up and we aren't selective about our data. I realize I am biased, but I know who I would believe in a choice between an economics professor and a politician like Mr. Evans."